Chris @Money$tir asked other financial literacy and financial independence (FI) bloggers, in a post on March 9, 2019, whether he should pre-pay his mortgage or invest the money. He provided his thought process and calculations. In this post, I will review his calculations and then show that his decision will be easier if he narrows his question and analysis. I will also provide my findings and analysis to help inform his decision. Chris’s post provides all of the background. You might want to read his post quickly to understand his calculations and other considerations before you read the rest of this post. Briefly, he will have just under $310,000 left on his mortgage on July 1, 2019. His payments are $1,525 and he will have an additional $4,000 a month available to either pre-pay his mortgage or invest. I followed up with Chris and learned that he expects to take the standard deduction on his tax return, so he will have no tax benefit from his mortgage interest. His marginal tax rateA “marginal” rate is the amount by which the result changes if you make an addition or subtraction to one value in the calculation. In this case, we add or subtract an amount from taxable income... More on ordinary income is 22%; on capital gains and dividends, 15%. I also confirmed that Chris does not have any pre-payment penalties associated with his mortgage. 1. Make $1,525 a month in mortgage payments until his mortgage is fully re-paid in July 2045, while investing the remaining $4,000 at 8% per year. 2. Take a middle-of-the road option and make mortgage payments of $3,525 each month and invest the remaining $2,000. Under this option, his mortgage will be re-paid in 2027. 3. Pay $5,525 each month – $1,525 in scheduled payments and $4,000 in pre-payments – until his mortgage is fully re-paid in 2024. In his post, Chris indicated he is leaning towards Option 3 – pre-pay his mortgage as quickly as possible. One of Chris’s questions is whether his calculations are correct. I re-created Chris’s calculations. While I did not get his ending balances exactly, my results were within a couple of percentage points, so I suspect we made slightly different assumptions regarding either the timing of the interest charges (beginning or end of month) and/or his exact mortgage balance. I’m quite comfortable that the calculations he performed are what he intended. I also confirmed that increasing his payments by $2,000 or $4,000 a month shortens the time until his mortgage is fully re-paid as he indicated in his post. Many of Chris’s considerations relate to additional flexibility he will have after his mortgage is fully re-paid. 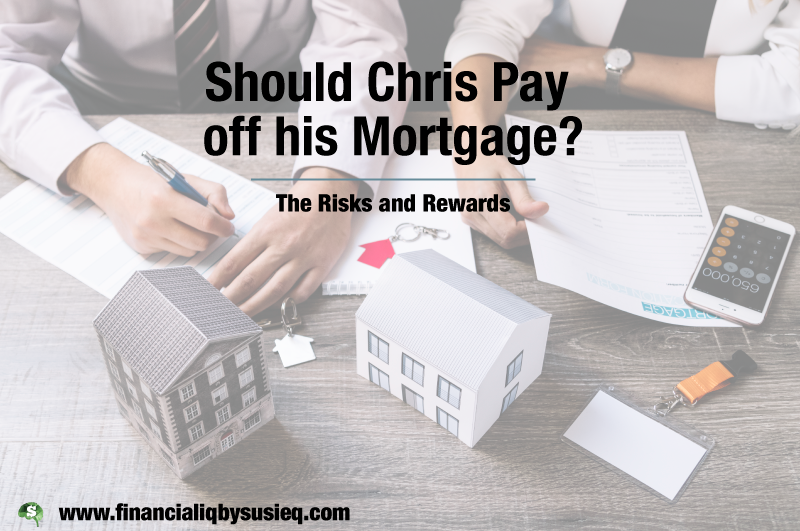 I believe that Chris has not correctly separated the mortgage re-payment question from his other decisions – renting out his house and buying a new one, not having a mortgage if he decides to downsize, freeing up money for other purchases and so on. That is, as discussed below, he can use his first five years of savings in Options 1 and 2 to make the rest of his mortgage payments. By understanding that, he can independently decide to do with the $5,525 a month after five years doesn’t depend on his choice of payment option. If Chris changes his calculations consistent with the re-framed question (i.e., looking at only the $5,525 a month for the first five years), he can eliminate all of the noise of these other questions as they will become independent of his mortgage decision. In his calculations, Chris has set aside $5,525 every month until his mortgage would be fully re-paid in 2045 if he made the minimum payments. Instead, I propose that he set aside $5,525 a month only until 2024 (and not after) – that is, only until his mortgage would be fully paid under Option 3. Except in certain situations discussed below, Chris will make his mortgage payments starting in August 2024 from the savings that accumulates from the money he saved up until then and not from his future income or other savings. That stream of payments, if invested in a hypothetical risk-free, tax-free financial instrumentAny investment that you purchase. Examples include an exchange-traded fund, a mutual fund, stock in an individual company, a bond and a money market fund. There are also many more complex financia... More at 3.625% would exactly pay off his mortgage regardless of which of his three re-payment options he chooses. By focusing on this shorter stream of payments until 2024, he can do whatever he wants with the $5,525 a month after his mortgage is paid off under all three re-payment options. As a result, his decision-making process can focus solely on the risks and rewards of his three re-payment options without any consideration of other, unrelated financial decisions. My re-framed question does not eliminate one of his considerations – his peace-of-mind from not having a mortgage. Chris will need to include this subjective consideration in his decision-making process, along with the considerations regarding riskThe possibility that something bad will happen. and rewards presented below. 1. I assumed that Chris set aside $5,525 a month from July 2019 through August 2024, rather than until 2045. In addition, except as noted below, after July 2024, he will make his remaining mortgage payments from the savings he has accumulated and not from his income. Therefore, starting in August 2024, he can use the $5,525 a month however he wants as I excluded it from my analysis. 2. I introduced the impact of income taxes. Chris will pay taxes on his investment returns which will make the first two options look less attractive than is shown in his analysis. 3. I quantified the riskThe possibility that something bad will happen. Chris will assume by investing in the first two re-payment options. 4. I focused on Chris’s financial position not only in 26 years (when his mortgage would be paid off making the minimum payments), but also in 10 years (when he might want to down-size). 1. Invest in 100% in stocks, such as an S&P 500 ETF. 2. Invest in 100% bonds, such as a bondA form of debt issued by government entities and corporations. fund. I used the Fidelity Investment Grade BondA form of debt issued by government entities and corporations. Index (FBNDX), as a proxy. 3. Invest 50% in each of stocks (an S&P 500 ETF) and bonds (the Fidelity bondA form of debt issued by government entities and corporations. index). Under all three strategies, I assumed the Chris would re-invest all interest, dividends and capital gains, after tax, and would not withdraw it except to make his mortgage payments. In my analysis, I calculated Chris’s financial position as if stocks and bonds had the monthly returns observed historically for the 10-year periods starting on the first of each month from January, 1980 through October, 2008 (10 years before my time series ended). There are 345 overlapping 10-year periods. For the 26-year time frame, there are only 153 overlapping periods covered by the Fidelity bondA form of debt issued by government entities and corporations. index data. I therefore looked at only the S&P 500 investment option when doing the calculations of Chris’s financial position in 2045. The infographic below clarifies the key dates under all three options and provides a teaser of the results. Under Option 1, Chris will make payments of $1,525 a month to his lender from July 2019 to August 2024 from his income. He will also save $4,000 a month over the same time period. This time period is represented in green. From August 2024 until July 2045, he will withdraw $1,525 from the savings he accumulated in the first five years to pay his mortgage. This period of time is shown in orange. Under Option 2, Chris will make payments of $3,525 a month to his lender from July 2019 to August 2024 (the green segment) from his income. He will also save $2,000 a month over the same time period. From August 2024 until December 2027 (the orange segment), he will withdraw $3,525 a month from his accumulated savings to pay his mortgage. He will have fully re-paid his mortgage by December 2027, so any leftover savings will remain invested until July 2045. This time period is represented in yellow. Under Option 3, Chris will make payments of $5,525 a month to his lender from July 2019 to August 2024 (the green segment) at which point his mortgage will be fully re-paid. Because he hasn’t put any money in savings, he will have no savings so nothing will happen related to the money from the green time period during the yellow time period. The infographic also calls out July 2029 and July 2045. These are the two dates that Chris mentions in his post as being possible decision dates. In ten years (July 2029), he might want to sell his house and downsize. In July 2045, his mortgage will be fully paid if he makes his minimum payments and it offers another point at which to consider selling the house. The infographic shows the balance of his mortgage and the average amount of his after-tax savings if he invests 100% in stocks. As will be discussed below, there is a lot of riskThe possibility that something bad will happen. around this average and it is calculated using historical returns, so there is also uncertainty around it. Here are the key findings of my analysis. They will be discussed in detail below. ● Chris’s time horizon is important in making his decision. o If he plans to keep his house until 2045, the historical data indicate he is better off in three-quarters of the scenarios making his minimum payments and investing in stocks. The average values of his after-tax savings are shown in the infographic above and show that he will have more savings on average with lower monthly mortgage payments. o If he plans to sell his house or use the money he has saved to fully re-pay his mortgage 10 years from now, the decision is not as clear cut and will need to consider his risk tolerancePersonal preference indicating how much risk you are willing to take to achieve a higher return.. Because Chris plans to continue to work for many years, he may be able to tolerate more riskThe possibility that something bad will happen. than someone who plans to retire before their mortgage is fully re-paid. ● Chris’s investment mix is important in making his decision. o If he plans to keep his house until 2045, the historical data indicate that he is better off investing 100% in stocks. o If he plans to sell his house or use the money he has saved to fully re-pay his mortgage 10 years from now, the mix of investments will depend on his risk tolerancePersonal preference indicating how much risk you are willing to take to achieve a higher return..
● The historical data indicate Chris’s downside riskThe possibility that something bad will happen. is not significantly changed by the stock market possibly being near its peak. I will start by providing insights on Chris’s financial position on average across all of the time series of historical investment returns – first for the 10-year period and then for the full 26-year period. I will then discuss the riskiness of the options. The last part of this discussion will focus on how I evaluated his results if the stock market were at a peak. The table below summarizes Chris’s average financial position, based on the historical investment returns, in 10 years on July 1, 2029, the time frame he referenced as possibly wanting to downsize. The invested asset row shows the balance of his investments if he sells all of his positions on that date and pays the related taxes. The “net worth” row shows the average amount Chris will have left if he pays off the balance of his mortgage with his after-tax investments. I use “net worth” in quotes because it includes only the assets emanating from the $5,525 per month for the next five years and only his mortgage balance as a liabilityWhen used as a noun, the amount you owe to someone else. When used as an adjective, an insurance coverage that protects you when you cause damage or injury to someone else or their property.. In addition, Chris will have his house, all of his other taxable savings, his retirement accounts, and so on and so forth. Because all of these other assets are the same regardless of which option he chooses for his mortgage re-payment, I have excluded them from the comparison. The positive “net worth” numbers mean Chris will get to keep the entire proceeds of his house if he sells it in 10 years plus the positive “net worth.” If there were negative “net worth” numbers (which there are in the graphs below), Chris would need to use that portion of the proceeds from his house to contribute to the settlement of his remaining mortgage balance. The farthest left column – paying off his mortgage as quickly as possible – is the option Chris indicated is his initial preference. Under this strategy, he will have saved no invested assets from the $5,525 a month for five years and have no mortgage balance, so would get exactly the proceeds of his house if he were to sell it then. The remaining columns show that, on average using the historical returns, Chris will have more savings than his mortgage balance if he makes his lower mortgage payments and invests the rest of his $5,525 per month than if he pre-pays his mortgage as quickly as possible. The smaller his mortgage payment, the higher his “net worth” or the more he will have available in excess of his mortgage balance in 10 years. For example, Chris will have a “net worth” of $34,396 at the end of 10 years, on average using historical returns, if he pays $3,525 a month towards his mortgage and invests the rest in 100% stocks as compared to $102,341 if he pays $1,525 a month towards his mortgage and invests the rest in 100% stocks. Because the average historical after-tax returns on his investments are higher than Chris’s pre-tax mortgage interest rateThe percentage which, when multiplied by the face amount or principal of a financial instrument, such as a bond, savings account or loan, determines the amount of interest that will be paid to or by t... More, he will accumulate savings above the balance of his mortgage. In addition, at the average, Chris is better off if he invests more heavily in stocks. For example, if Chris makes his minimum mortgage payments and sells his house in 10 years, he will have $27,033 in after-tax savings if he invests 100% in bonds as compared to $102,341 in after-tax savings if he invests 100% in stocks. I also calculated the averages for the 100% stocks investment strategy using the longer time period (back to 1950). While the results are slightly less favorable, they show generally the same results as are shown in the 100% stocks columns in the table above. The table below summarizes Chris’s average financial position on July 1, 2045, based on the historical investment returns. As discussed above, I don’t believe there is enough historical data regarding bondA form of debt issued by government entities and corporations. returns to include those investment strategies in this analysis. This table therefore shows results only based on the 100% stocks investment strategy and is based on stock returns going back to 1950. This table shows that the smaller mortgage payments Chris makes, the higher his savings will be 26 years from now on average using the historical returns. So far, I have focused on Chris’s average returns. I mentioned in my introduction that one of the aspects of his decision that Chris does not quantify is riskThe possibility that something bad will happen.. By looking at his “net worth” under 345 different historical scenarios (i.e., the number of complete 10-year time periods in my historical data) regarding bondA form of debt issued by government entities and corporations. and stock returns, we can get a sense for the riskiness of Chris’s choices. The graph below is called a box and whisker plot. My post on riskThe possibility that something bad will happen. provides additional information about these graphs. The boxes represent the 25th to 75th percentiles of Chris’s “net worth” at 10 years. That is, I put the 345 “net worth” results in order from smallest to largest. The 25th percentileThe value below which a stated percent of observations fall. For example, 25% of the observations fall below the value corresponding to the 25thpercentile. is the 86 th one on the list; the 75th percentileThe value below which a stated percent of observations fall. For example, 25% of the observations fall below the value corresponding to the 25thpercentile., the 259th. The whiskers (lines sticking out from the ends of the boxes) represent the 5th percentileThe value below which a stated percent of observations fall. For example, 25% of the observations fall below the value corresponding to the 25thpercentile. to the 95th percentileThe value below which a stated percent of observations fall. For example, 25% of the observations fall below the value corresponding to the 25thpercentile. and correspond to the 17th and 328th in order from smallest to largest. Taller boxes and wider spreads between the top and bottom of the whiskers represent more riskThe possibility that something bad will happen.. The placement of the boxes up and down on the graph show the overall level of the results. That is, boxes that are higher on the graph have higher returns than boxes that are lower. This graph shows Chris’s “net worth” after 10 years under each of the investment and re-payment strategies. Chris’s Re-payment Option 3 – pay off his mortgage as fast as possible – is shown on the far left. Because he makes no investments under this option, there is no riskThe possibility that something bad will happen. and he always has no savings at the end of 10 years. As either the percentage of investments in stock increases or the amount of savings increases (moving to the right on the graph), both the riskThe possibility that something bad will happen. and level increase. That is, with more savings, the boxes are higher on the graph and taller (e.g., compare the $1,525/0% Stocks box with the $3,525/0% Stocks box). The same comparison can be seen as the percentage of stock increases, by looking at the $1,525/0% Stocks relative to the $1,525/50% Stocks and $1,525/100% Stocks. The tops of the boxes, tops of the whiskers and average values (shown in the table above) are all clearly higher with lower mortgage payments and a higher investment in stocks. The bottoms of the boxes and bottoms of the whiskers are all lower, though, so those options have more riskThe possibility that something bad will happen..
Making a decision from the box & whisker plot can be challenging. If Chris is willing to view his risk-reward trade-off as being between his average “net worth” and his worst “net worth,” he can narrow down his choices. The drawback of this approach is it considers only one point in the range of possible results for measuring riskThe possibility that something bad will happen.. The graph below is a scatter plot showing the different options. My post on financial decision-making provides more insights on this type of graph. The x-axis (the horizontal one) shows Chris’s average “net worth” in 10 years. The y-axis (the vertical one) shows the worst “net worth” result observed based on the historical returns. Points on this chart that are up (worst results aren’t as bad) and to the right (higher average result) are better than points that are lower or to the left. I have drawn a dashed line, called the efficient frontierWhen evaluating different options, the set of points for which there are no other options that either have a higher return for the same amount of risk or less risk for the same return., that connects those strategies (dots) that are optimal in that there are no other dots that have a higher average with the same worst result or have a higher worst result with the same average. Using the worst result as the sole measure of riskThe possibility that something bad will happen. would allow Chris to narrow his choices down to the four on the efficient frontierWhen evaluating different options, the set of points for which there are no other options that either have a higher return for the same amount of risk or less risk for the same return., depending on how much riskThe possibility that something bad will happen. he is willing to take. You’ll see that there are two orange dots on this graph. They represent the points using the S&P 500 returns going back to 1950, whereas the blue points all use data starting in 1980. What I found most interesting is that the worst results are the same for both time series, though the average results are somewhat lower using the longer time series. The worst results occurred using the time series starting in February 1999. The graph below shows the box & whisker plot of Chris’s “net worth” in July 2045, using the historical returns. The 25th percentileThe value below which a stated percent of observations fall. For example, 25% of the observations fall below the value corresponding to the 25thpercentile. of Chris’s “net worth” under all three options is about $0. As such, in 75% of the historical scenarios, Chris will be somewhat to significantly better off making smaller mortgage payments than making larger payments. The much clearer results shown in this chart as compared to the one at 10 years results from the benefits of diversification over time. That is, the longer time period over which Chris is invested, the less risk there is in his financial results. Diversification is one way a portfolio can be diversified. Investing in both stocks and bonds is another. My post on how diversificationThe reduction in volatility created by combining two or more processes (such as the prices of financial instruments) that do not have 100% correlation. reduces investment riskThe possibility that something bad will happen. discusses these concepts in more detail. The scatter plot below shows that in the worst scenario, Chris ends up losing about $120,000 over 26 years if he is 100% invested in stocks. The trade-off is that in 75% of the historical scenarios, he will have at least some savings and more than $370,000 in savings on average. Another concern that Chris and others on Twitter expressed is that the stock market has been going up for many years and is at riskThe possibility that something bad will happen. of going down significantly in the near future. The eight green circles correspond to important peaks in the market, similar to Chris’s concern about today’s market. I looked at Chris’s “net worth” ten years after each of those peaks, as shown in the table below. Recall that the bondA form of debt issued by government entities and corporations. index data are available starting only in 1980, so we can’t look at any strategies that include bonds for the earlier peaks. In some of the time periods, particularly the ones starting on November 1, 1965 and November 1, 1968, Chris would have been better off pre-paying his mortgage as quickly as possible rather than investing. In others though, he would have been much better off making his minimum mortgage payments. The average result for the most recent 4 “bad” time periods (third-to-bottom row) is slightly better than the average result across all possible time periods (bottom row). If all eight periods are included, Chris is better off making minimum payments, but not by as much as was observed in all scenarios. In several of the “bad” periods (e.g., the ones starting on 12/1/1980, 8/1/1987 and 6/1/2007), Chris ends up with a very high “net worth” if he invests 100% in stocks. Although Chris buys some stocks at the peak of the market, he will also buy stocks as the prices go down (generally taking a year or two). The graphs above show that the market often re-bounds fairly rapidly after it has fallen. In these situations, Chris will achieve a high return on the stocks bought at or near the bottom of the market, thereby boosting his overall return. Dollar cost averaging is the process of making regular investments regardless of the market cycle. 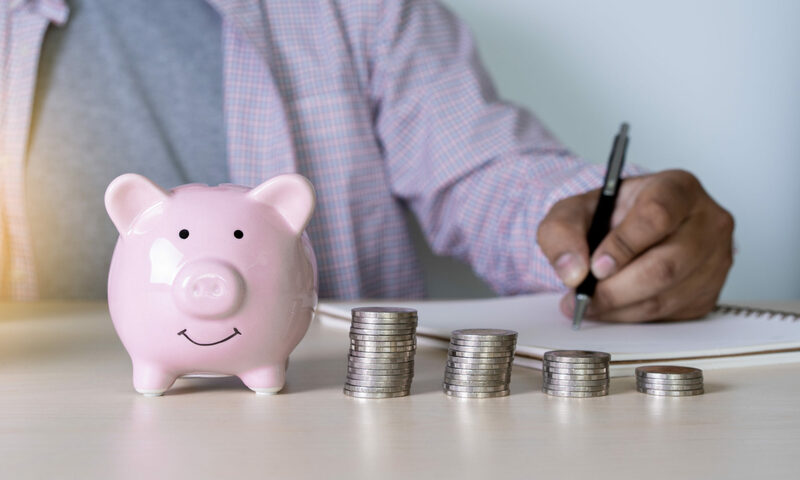 It is a common investing approach and, although it may not be intentional, it is exactly what you do when you contribute to a 401(k)A type of Defined Contribution Plan available in the US. There are three types of contributions that can be made to 401(k)s.
• Pre-tax - No taxes are paid on the contributions or any changes in... More through payroll deductions. Dollar cost averaging lets you buy stocks at all levels, without timing the market, which can produce better total returns than trying to time the market and make your investment on a single day or just a few days a year. If Chris invests monthly, he is implementing a dollar cost average strategy. The findings presented here depend on a large number of assumptions. I used historical monthly returns on the S&P 500 and the Fidelity Investment Grade BondA form of debt issued by government entities and corporations. Index (FBNCX) downloaded from Yahoo Finance. I assumed that any dividends and distributions, reduced by any related income taxes, were immediately reinvested. Yahoo Finance provides a Closing Price and an Adjusted Closing Price. I used the percentage changes in the Adjusted Closing Price to calculate the total return for each financial instrumentAny investment that you purchase. Examples include an exchange-traded fund, a mutual fund, stock in an individual company, a bond and a money market fund. There are also many more complex financia... More. For the S&P 500, the Closing Prices and Adjusted Closing Prices were identical. For the BondA form of debt issued by government entities and corporations. Index, they were not. I assumed that the difference in the percentage changes between the Adjusted Closing Price and the Closing Price were interest payments. I assumed that Chris would fund any shortfalls from current income or other after-tax savings and that there would be no borrowing costs or additional taxes. ● All investments will be held in taxable accounts. Chris is already contributing the maximum amounts to his tax-sheltered retirement plans. In addition, he might encounter penalties if the withdrawals needed to make his mortgage payments did not meet the guidelines of the specific tax-sheltered account to which he made contributions. See my post on retirement plans for more details on such withdrawals. ● The interest payments from the BondA form of debt issued by government entities and corporations. Index will be taxed at Chris’s marginal rate on ordinary income of 22%. ● Chris will pay tax at his marginal capital tax rate of 15% capital gains and losses when he sells his investments, either to make mortgage payments or withdraws the money at the end of 10 years or 26 years. ● Chris’s marginal tax rates won’t change over the time horizon of the analysis. ● There were no tax implications of borrowing. Having been a consultant for over 20 years, I feel it necessary to touch on the many limitations on the findings of the analysis. Most importantly, actual results will vary from those presented herein. I have used historical data as a proxy for what might happen in the future. However, it is unlikely that future results will exactly replicate any results previously seen. If any of the assumptions discussed above or otherwise made do not turn out to be appropriate to Chris’s situation, the findings may similarly be relevant to his decision-making process. An important component of these differences is the interest rateThe percentage which, when multiplied by the face amount or principal of a financial instrument, such as a bond, savings account or loan, determines the amount of interest that will be paid to or by t... More environment. As shown in the chart below, interest rates (as measured by the 10-year Treasury in this chart) declined or were flat during almost the entire period from 1980 to the present – the time period for which data were available for the BondA form of debt issued by government entities and corporations. Index. It is more likely than not that interest rates will increase during the time horizon of this analysis. When interest rates increase, bondA form of debt issued by government entities and corporations. prices tend to decrease. If that were to happen, the findings based on historical bondA form of debt issued by government entities and corporations. returns likely overstate the results that might be observed in the future. I downloaded S&P 500 and the Fidelity bondA form of debt issued by government entities and corporations. index monthly returns from Yahoo Finance. Data were available for the S&P 500 going back to 1950, but only to 1980 for the Fidelity bondA form of debt issued by government entities and corporations. index. To the extent that these data are incorrect, the findings herein might also be incorrect (i.e., garbage in, garbage out). The purpose of this analysis was to provide insights to help Chris make a more informed decision. It should not be interpreted as making a recommendation for any financial decision. The only information I have about Chris’s financial situation is what is outlined above and in his post. As such, there may be other aspects of his financial situation that cause this analysis to not apply correctly to his specific situation. Lastly, the analysis may not be applicable to anyone else’s specific situation. This is amazing! This really opened up my eyes to the possibility in Option #1, and I’m excited to publish my followup post that talks about what we are going to do in mid-April. You’re welcome. 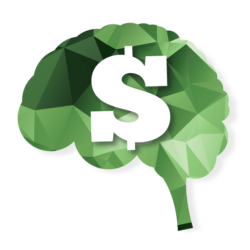 The purpose of my blog is to provide information to help people make more informed decisions, especially as they relate to the dollars and cents, so this post was a lot of fun for me to write. It is also, of course, very gratifying to know that you have taken so much time to understand my perspectives and consider them in your decision-making process. For many people, the risk-free option of pre-paying their mortgage is the right one due to their inability or unwillingness to absorb the risks of investing. Nonetheless, pre-paying your mortgage isn’t the right decision for everyone and many people who can take the additional risk can also have a high probability of ending up in a better financial position. As someone who loves data, this is the most amazing thing I’ve seen on a pf blog. Very impressive and thorough. Really nice analysis!, Susieq! Very good in depth analysis of Chris’ question! Hello There. I found your blog using msn. This is a very well written article.I will make sure to bookmark it and come back to readmore of your useful info. Thanks for the post. I will certainly comeback.